Project Renew: We've switched from those hot summer months into the bitter cold or the cooler seasons and it's time to switch up our skincare. Before we do this, doesn't our skin deserve a good pamper for dealing with that harsh switch? I've rounded up a few beauty goodies that will serve to set your skin right. A good place to start is to remove all that makeup with a dedicated oil cleanser that is going to knock your skin back into shape. The strong citrus smell combined with the benefits of radiant skin and we're on to a winner. A few sweep of this with a cotton pad, teamed with a little warm water and a flannel and makeup melts off the face. What you're left with is revived skin, nourished with vitamin C, olive, grape seed and rose hip oils. Soft, cleansed and perfect for everyone. One cleanser I haven't stopped raving about since it landed on my doormat, it just does it all and more. Skin can get very irritable and sensitive during the transition from one season to another, especially when the weather takes a drastic turn. Even for those of us with skin that's on the mark all year round, it's worth taking extra care and investing in a cleanser for sensitive skin so balance is well and truly kept. Both soothing and calming, a pump of this massaged onto your face and removed with the muslin cloth provided will result in reduced redness and a soft canvas to work with. Great for younger skin, the Good Things range has really hit the mark with their super fruit mask. Not only does it smell good enough to eat with the mixture of avocado and goji berry, but skin feels free of impurities and glowing: all with no parabens! A thin layer of this left on for the designated five minutes, rinsed off with a warm flannel and you'll feel the results. Perfect for a mid week pick-me-up skin boost on a budget. A recent addition to my skincare stash, but a solid favourite. This soothing rehydrating mask is great for a complexion dulled from the change in temperature and ideal for those with sensitive skin that may not be able to use the harsher, heavily fragrances masks on the market. This one requires a little longer to get to work, but in that 10 minutes all your dehydrated skin woes disappear. Any taunt skin from the cool air is injected with a deeply hydrating, soothing dose of thermal spring water that I haven't been able to rival with any other mask. It's time to draw out the last of those impurities and slough off any residual dead skin that may have been left behind by the face mask. In one fell swoop we can rid the skin of clogged pores, reduce them and minimise and break outs with a simple sweep of this exfoliating toning lotion. Great for combination to oily skin, I find this helps my t-zone and balances out my skin so that I can tackle my dry areas. Not only does my skin feel supple, but it looks vibrant and much clearer. Now it's time to give your skin a fighting chance, it's the final step and we want to prepare it for what's to come. Morning and evening, without fail, I've been using this exceedingly rich lotion to combat and irritants in my makeup or moisturiser. I can sometimes find my skin irritated by the smallest of things, a new concealer, a foundation I haven't used for a while and this stops that in it's tracks. No more touching my makeup and making things worse, this little concoction contains a strong calming agent that works to to reduce skin irritability. I've been searching for something like this for a good few months now and it's definitely become holy grail material. So there you have it, six skincare products that should become staples in your A/W routine. Will you be shaking up more than your makeup this coming season? I have such a need to go beauty shopping! This post hasn't helped! 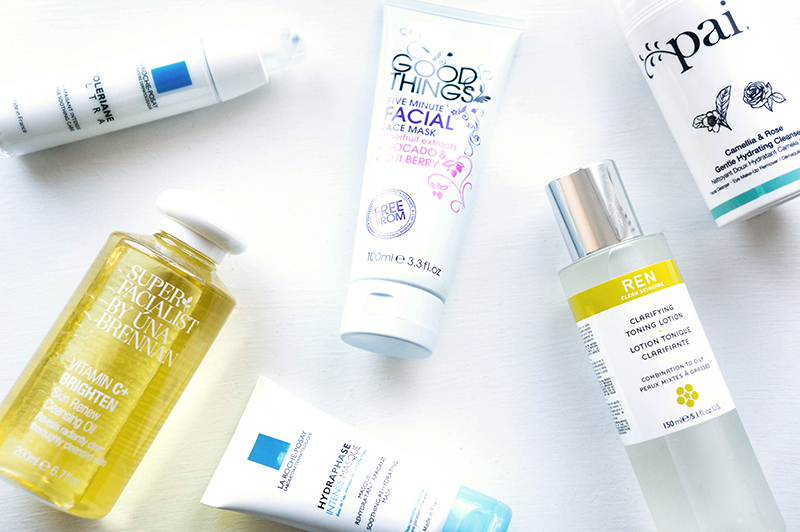 A beauty binge is on the cards! I've had my eye on the Good Things Facial Mask but now i'm even more eager to try it! My boyfriend actually convinced me to get this one. Amazing! So good, and worth every penny. I'm trying to make my skin routine really simple and not have a million of everything so I'm just using stuff up before I open anything new :) But I'm trying to be really strict about using a serum and eye cream. I am with you on that one Annie, I think as we get older we'll thank our younger selves for taking the extra time to do it. I love that toner and would love to try the rest of those products. Oooh, that La Roche-Posay moisturizer sounds lovely. It's great for irritable skin. I don't use it every day, but it's handy for when I've gone a bit makeup heavy the day before. REN lotion? Ok, that is too funny. Still sounds nice, though. I used to never have to worry about dry flaking, due to my genetically inherited oily skin. But it's been a problem in this Texas climate. Hmm, I wonder whether I should invest some time with Ross about male skincare routines. At the moment I'm completely out of toner, so that REN Clarifying Tonic Lotion is sounding pretty great! I get nervous using it, wanting it to last as long as possible.